Could Renault be on the brink of pulling off one of its master strokes yet again? The French giant has a history of being an early adopter, rather than inventor, of new market categories and popularising them before other mass-market brands jump on the inevitable bandwagon. 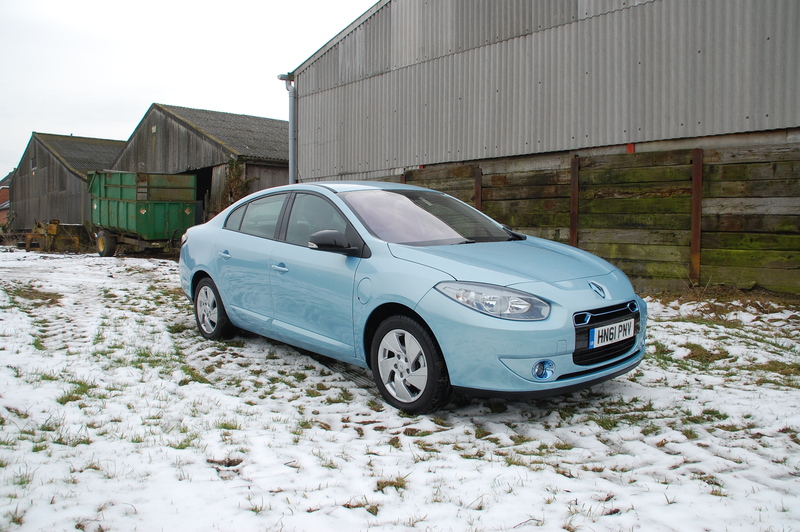 Is the Fluence the latest outmanoeuvring of the competition? If it’s not immediately obvious, under that regular four-door saloon body, isn’t a car propelled by conventional means at all but rather one powered by an electric motor. And that relative ordinariness could be the key to its success or failure on the market. Whereas other electric cars sold here are either purpose designed (like Nissan’s LEAF) or look unusual anyway (see the i-MiEV/C-Zero/iOn triplets), the Fluence is essentially a typical family saloon that happens to be electric. Is this the passport to acceptance for EVs? The Fluence has been on sale on the Continent for a couple of years now, powered by both petrol and diesel engines. If it looks somewhat familiar, that’ll be because of the Mégane link, for save a unique nose design, the Fluence is the booted version of the hatchback – the name change allows it to occupy a different position in the marketplace. British sales for the regular Fluences were considered too small to be economically viable, so it never appeared here, until now. And despite the other power plants theoretically being available, it will only be sold in the UK as a ZE (zero emissions) model. If you hadn’t already noticed, in the battlefield of environmentally friendly marketing themes, blue is the new green. 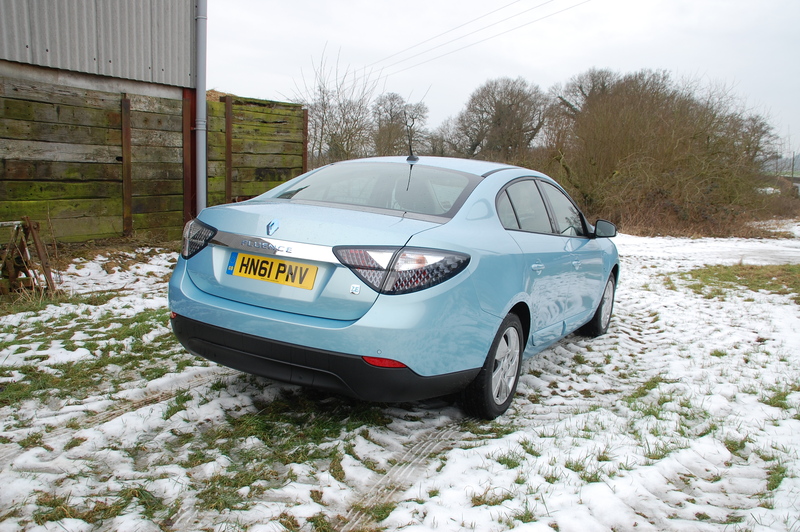 Renault’s taken this idea and gone somewhat wild with it; the electric Fluence is positively chilled with pale blue addenda. 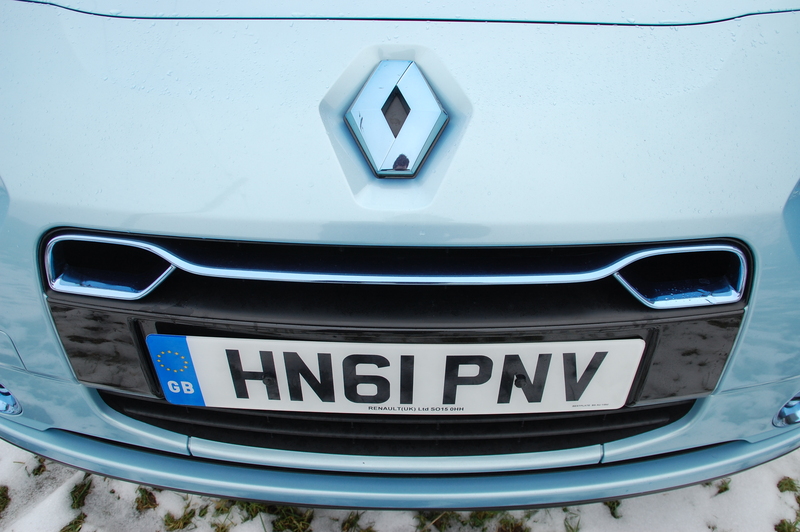 The front and rear lozenge badges, the grille surround, lamp bezels and the ‘Fluence’ script across the boot plinth are all blue. 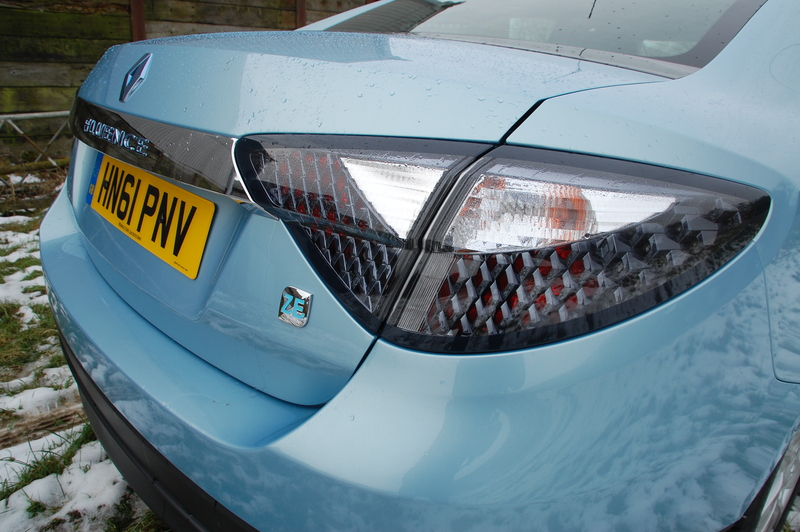 Even the colour of the test car was Energy Blue, although the metallic hue is a £455 option. 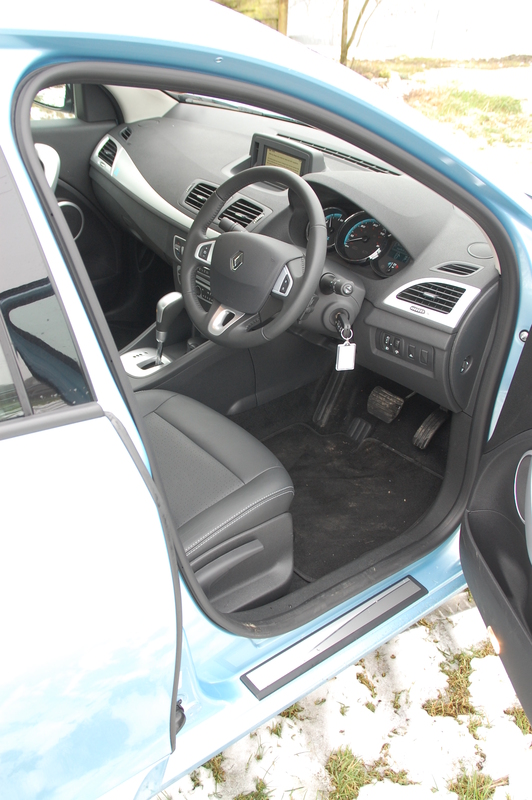 Close the door with a solid thunk after you’ve ensconced yourself in the driver’s seat and there’s even less to give the game away, as at first glance the interior looks stock Mégane. 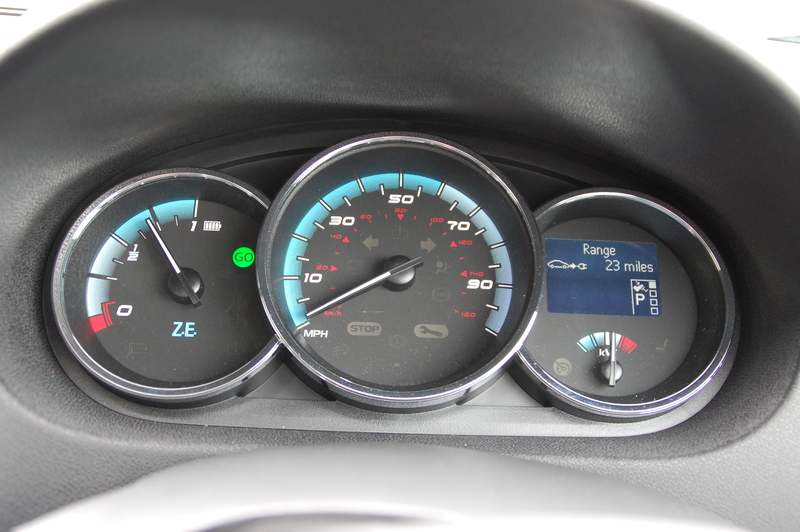 But a closer inspection reveals a couple of clues: the ZE badge on the passenger side of the dashboard trim and within the instrument binnacle, the rev counter has been displaced by a battery reserve gauge. Oh, and of course, some pale blue highlights. Press the stop/start button, slide the automatic gear lever into ‘D’ and release the brake. Everything is eerily silent at first, aside from the accompanying electronic beep to confirm the Fluence is online. As you build up speed the whirring of the electric motor becomes more noticeable but it’s never a distraction or so high pitched that it becomes an annoyance; it’s just a different sound to what you would find in a petrol or diesel-powered car, albeit even less perceptible in the cabin. On this Dynamique specification Fluence, the interior is well appointed, with dual zone climate control, all round electrical control of the windows and mirrors, automatic lights and wipers, cruise control and Carminat TomTom ZE Live – an intelligent satnav system that calculates the car’s theoretical range and navigates via charging stations. Unfortunately my test was too short to check this out but in theory it sounds like a great idea. 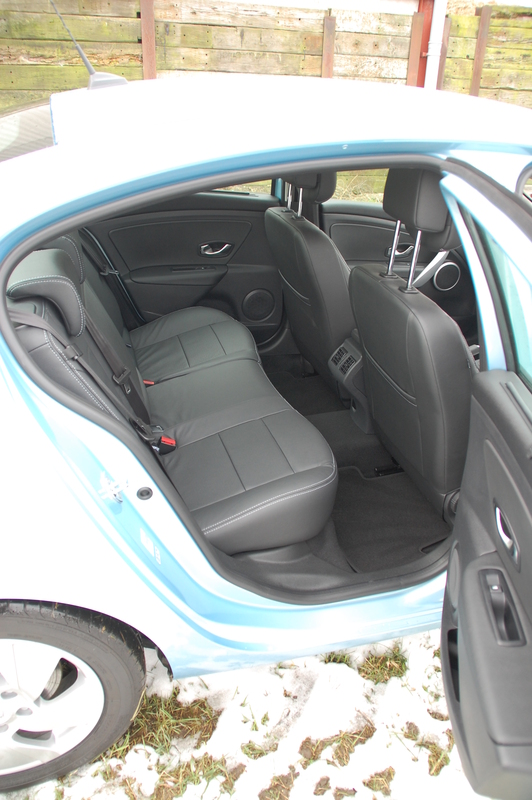 The illustrated leather upholstery is a £940 option but it does lend the cabin a more sumptuous, if dark, aura. The combination of the continuously variable transaxle automatic gearbox and the smooth progression of torque from the electric motor ensures that acceleration is linear if not exactly brisk. Keeping up with urban traffic will prove no problem but getting up to speed on dual carriageways and motorways you will find yourself battling for track position with superminis and SUVs, rather than surging turbo diesel repmobiles. That said, those company car drivers will easily outlast the Fluence’s 115 mile range before you need to recharge the batteries. On the open road, the Fluence feels just as you’d expect a medium-sized automatic saloon without sporty pretentious would. The ride and handling set up is focused upon comfort rather than keen cornering; the steering feels just on the over-assisted side of being finely balanced. It’s a safe, predictable package which can be driven well within the confines of its electronically governed 84mph top speed but in a manner that’s unlikely to get your pulse racing through the sheer excitement of the experience. Nevertheless, it is amusing seeing the faces of passers-by in built-up areas as you drive along barely making a noise. Will the Fluence be the car that sparks an electric revolution on Britain's roads? Despite it being entirely conventional, drive train apart, with the Fluence we could be looking at one very real and tangible glimpse into the future of motoring. Its ordinariness could be the very catalyst to convert more to the growing appeal that electric driving can provide. Acceptance might be just around the corner – time will prove Renault and doubtless soon others, right or wrong.